In recent months, as tensions between the United States and North Korea escalate toward violence, conventional methods for maintaining peace seem limited. Bellicosity and irrationality dominate each side, rendering traditional diplomatic outreach fruitless. In the current climate, unconventional approaches, with a focus on interpersonal relationships, could be most conducive to peace. One such option involves a certain defensive expert. He holds the distinction as (perhaps) the sole mutual friend of President Donald Trump and Supreme Leader Kim Jong-un. Of course, I am referring to the Worm, Dennis Rodman, the one man standing between war and peace. 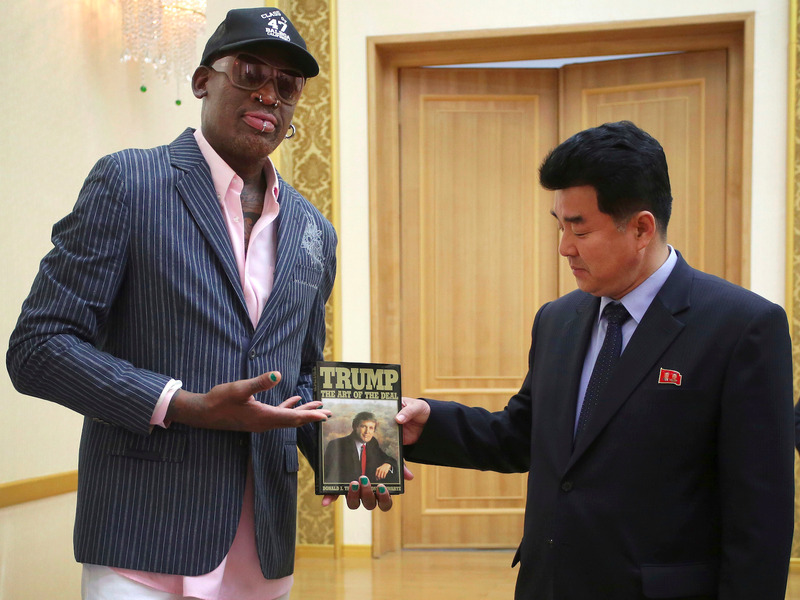 Rodman traveled to North Korea multiple times as an ambassador of “Basketball Diplomacy” during the current Kim reign. He trained the North Korean national team and took part in an exhibition game during Kim’s birthday celebration. More importantly, he struck up a friendship with Kim and met Kim’s young family. At the time, Rodman had hoped to bring Kim and then-President Barack Obama together since both shared a common interest in basketball. A simple conversation between the two could have vastly improved US and North Korean relations. Instead, Obama impeded this potential detente by refusing even to take a phone call from Rodman. With a new President, circumstances have changed somewhat. Rodman’s friendship with President Trump is widely documented. He appeared on two seasons of Trump’s hit reality show Celebrity Apprentice. He endorsed Trump’s 2016 candidacy early on in the campaign. If Rodman made a call to the White House now, perhaps the President would answer. Trump differs from Obama in his emphasis on interpersonal relationships. Interestingly, Kim’ s leadership style also places a high value on interpersonal relationships. Were Rodman to bring his two friends together to speak on friendly terms, a lasting peace may be forged yet. Of course, there are problems this approach does not address. The longstanding North Korean strategy of ratcheting up war rhetoric and testing missiles to extort the US will probably continue. The neocon reflex to bomb other countries regardless of the consequences will likely remain a fixture of US foreign policy. However, if Dennis Rodman can foster a relationship between Trump and Kim, Kim may be more open to economic partnerships as opposed to threats, and Trump may be less likely to listen to the neocon voices who clamor for war. There’s no simple solution to the situation in North Korea, but Dennis Rodman may be in a position to help. An unconventional man helping two unconventional leaders could be the unconventional method needed to bring us closer to peace than war. Great idea, William! I hope it gets traction. Add another freak to the freak show. why not? CNN reports Rodman heading to North Korea. I mean, really! I just saw it on the interweb. No reaction to Rodman going to N. Korea? Rodman going to N. Korea is a great diplomatic move. It shows the Trump administration is on the path toward peace. This is how we make peace. No, it shows another freak in the freak show. None of whom know anything about peace; quite the contrary. Who dresses Rodman? That is a crime against fashion! WSS, you have been kidnapped and brainwashed or substituted with a supercomputer. Petition Calls for Dennis Rodman to be Removed from Hall of Fame. -Kevin Spain, AJ Perez, USA Sports. It is sad and unfortunate that Otto Warmbier died. At least he was able to come home to his family before it happened. Dennis Rodman credits his own diplomacy with securing the release of Warmbier. Criticism of Rodman’s role here is misplaced. His actions brought us closer to peace. I hope he continues his outreach to the North Korean regime. WSS wouldn’t have said any of this. Throw in Pewtin as a fourth freak.